Fusce dapibus, tellus ac cursus commodo, tortor mauris condimentum nibh, ut fermentum massa justo sit amet risus. Nullam quis risus eget urna mollis ornare vel eu leo. CHICAGO, April 11, 2019 — RiverStar, a contact center software and custom applications solution provider, today announced that it will be debuting QueView — a custom cherry-picking email application — at the upcoming Interactions 2019 NICE inContact customer conference. RiverStar is a proud Silver sponsor of the event, which takes place April 15-17 in Las Vegas, Nevada. Attendees who visit the RiverStar booth will have an opportunity to demo the QueView software application and see how it empowers organizations to answer emails rapidly and with greater accuracy, as well as close cases faster, increase SLA adherence, and better leverage agent expertise and areas of specialty. QueView, integrated with NICE inContact CXone, provides custom responsiveness and better control over email handling by allowing supervisors and agents to assign emails to agents based on availability, skill or any other criteria. RiverStar’s suite of applications integrated with CXone provide campaign management, customer interaction tracking, reporting, notifications and alerts, survey development, appointment scheduling and workflow automation. To learn more about QueView, visit https://www.riverstar.com/queview or connect with RiverStar on the NICE inContact CXexchange partner product marketplace at https://cxexchange.niceincontact.com/home. Our consultants assist with specialized points of integration — and are experts in extending the value of existing systems, by creating custom desktop workflows that work with these systems to streamline complex customer-facing processes. RiverStar helps our customers achieve tangible results, such as increasing agent productivity by 35%, conversion rates by 25% and first call resolution by 20% — as well as reducing call handling time by 10% and training time by 50%. Some of the world’s largest organizations across multiple industries have entrusted RiverStar with their complex customer-facing processes. RiverStar is a proud DEVone member with products available on the CXexchange partner product marketplace. It’s no secret that much of the declining healthcare in the United States today can be tied to a series of complex physiological, social and economic issues that are present in impoverished communities throughout the U.S. The non-clinical factors that impact an individual’s healthcare can include a host of influencing factors such as access to housing, job status, family support, nutrition, community safety, diet and exercise, access to child care and many other factors — even the ability to pay a monthly heating or electricity bill on time can have an immediate and long-lasting health-related impact. Because many impoverished patients have very complex social, socioeconomic and psychological needs, it can be challenging for traditional healthcare systems to meet their needs — and they can become what’s referred to as a “frequent flier” or a “high utilizer” in many hospital emergency rooms across the U.S.
For instance, a recent program at the 872-bed Parkland Memorial Hospital in Dallas, TX, (one of the 10 biggest hospitals in the U.S.) has seen a surge of high utilizers, identifying as many as 96 patients who had visited the hospital at least 10 times in one month, some running up unpaid bills of over $100,000. In fact, the hospital spent a staggering $871 million on uncompensated care in 2016. 2 These frequent fliers not only overcrowd emergency rooms and increase wait times, but they also put financial strain on the healthcare system, and in turn impact other patients, without addressing the underlying needs of those high utilizers. Hospitals across the country are desperately looking for proactive solutions to address this issue. In fact, Parkland Memorial has aggressively developed a system of integrating healthcare with community services in an effort to reduce high ER utilization rates and drive down costs. 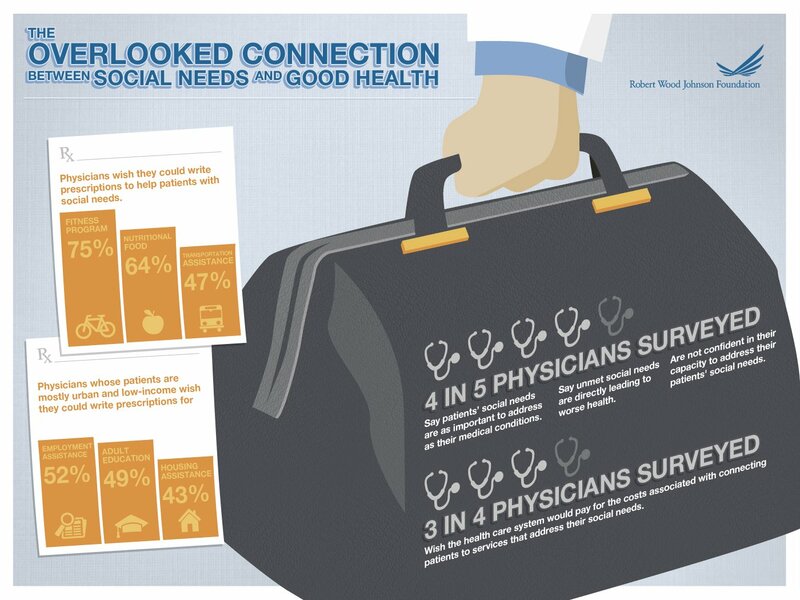 As hospital systems and emergency rooms are facing mounting pressure to improve healthcare outcomes, while at the same time cutting costs, many are looking for ways to better connect their patients with the community resources that they know will help their social determinants of health and, in turn, improve their healthcare outlook. The challenge is that if a hospital has a social team on staff to conduct a mental or social health assessment, many do not go deep enough to truly identify an individual’s needs. For example, a traditional assessment may only have 5-10 questions, such as “Do you need assistance for housing?” or “Do you have enough food to eat?” These questions typically aren’t able to identify an individual’s true needs — nor can they effectively rank-order the most critical needs that will help move an individual to self-sufficiency. As RiverStar has worked with multiple healthcare and community-based organizations, we’ve developed a system that’s been proven to not only identify an individual’s needs, but to connect them with the resources they need to improve their situation — and, in turn, reduce the overall weight on the healthcare or social service organization. The RiverStar solution follows a 3-step process, starting with a HIPAA compliant health and wellness screening. This provides validated results to diagnose and pinpoint issues related to social determinants, behavioral health and/or substance abuse. The screening not only covers the 19 Social Determinants of Health domains in the Arizona self-sufficiency matrix, but it also covers additional domains related to healthcare costs, literacy and the cost of utilities. To complete the screening, a nurse practitioner, case worker, care navigator, or other care provider guides the patient through the questions, which are are phrased in an easy-to-understand fashion, protecting the patient’s dignity and increasing the likelihood of honest answers. This screening process provides an incredibly detailed snapshot of the patient and outlines areas of assistance required for the development of a care plan. What’s more, the areas of need are prioritized to develop a triage of urgency — ensuring the most critical needs can be taken care of first. Equally as critical as identifying the patient’s needs is matching the patient with the resources needed to get help. This is the second step of the process, and because the screening identifies needs at a very precise level, patients can be immediately matched with community resources via a searchable database. Once a resource is identified, referrals can be made on-the-spot, eliminating the possibility of the patient being released and never following through on the appointment setting. As private practices, hospitals and emergency rooms seek to improve care while simultaneously driving out unneeded costs, the challenge of high utilization rates must be addressed. By helping connect patients with the community resources they need and pairing those resources with best-in-class healthcare, we can help bridge the gap between healthcare and social determinants. Poverty can be tied directly to the unmet social needs that beset the millions of clients served by health and human services organizations across the country. The TTS model begins with the premise that poverty is not a character flaw. Poverty, like any known health issue, is caused by environmental exposures, and is a treatable condition. TTS establishes the first standards of care to treat the condition of poverty, responding to the social determinants of health by coordinating care across healthcare, human services, government, faith- based organizations and educational organizations. By aligning on a uniform set of coordination of care protocols and analytics based on evidence-based practices, the TTS model seeks to improve the health and self-sufficiency for clients of all ages. TTS protocols assess, respond and measure outcomes related to social determinants affecting health, education and economic self-sufficiency across 19 domains. In addition, TTS integrates four primary therapeutic interventions identified by research: comprehensive care management, volunteerism, life coaching and financial literacy. By aligning on a uniform set of coordination of care protocols and analytics based on evidence-based practices, the TTS model seeks to improve the health and self- sufficiency for clients of all ages by assessing, responding to and measuring outcomes. Trained providers use the TTS method to collaborate closely with direct care professionals and a broad range of social service agencies: health, education, faith-based, government and human services. TTS facilitates and coordinates existing services that are already funded into logical, effective step-by-step processes. This is accomplished by creating a plan called CARE (Coordinating All Resources Effectively). Clients are assisted in building a “Map of My Dreams” that establishes a set of goals for the client and the map that will guide the client to the realization of those goals. This includes volunteerism and financial literacy — and human services professionals and peer mentors work with clients to effectively follow their map to realize their dreams. The TTS model has already been put to use and evaluated across the nation, and is providing a higher quality of service to thousands of people, yielding statistically significant results. Detroit has become a significant testing ground for TTS. It was in the Motor City where the TTS model began to break down the isolated, compartmentalized silos that exist between organizations and produce noticeable results. TTS also established a “train the trainer” model, which has caused TTS to multiply as trainers, curriculum and the use of efficient measuring tools increased. Significant impact can be seen in Detroit, Michigan, via the Matrix Human Services Head Start Program, which utilized the TTS Standards of Care to treat the condition of poverty. In 2015, integrating client volunteerism, a demonstrated best practice in the treatment of poverty, Matrix volunteers provided 250,000 hours of volunteer services. This is not inclusive of the volunteer services provided by clients at other businesses and organizations. In 2015, working with community partners, 15 tons of fresh food were delivered to Matrix locations every week and distributed by client volunteers. This vital program was maintained without any additional funding to Matrix. 100 percent of Matrix Head Start children received hearing and vision screenings. 98.5 percent of children enrolled in the program were up-to-date on immunizations, utilizing existing healthcare funding streams at no cost to the organization. 90 percent of referrals to supportive services (food, clothing, etc.) made to clients enrolled in non-medical case management were successful (203 referrals out of 225). The TTS model, collaborative technology, shared treatment protocols and shared data security can drive benefits in improved health outcomes, improved economic self-sufficiency, healthier communities, lower healthcare costs and better health education. This ultimately leads to the ability to realistically and effectively create a person-centric, transformational community change — maximizing existing funded services to improve health and economic self-sufficiency for individuals and families. Learn how the Community Health Hub powers the TTS model to create a solution that effectively addresses the issue of the negative impact of poverty on healthcare — and creates a unified technology that bridges the gap between healthcare and the lack of resources for social determinants to deliver improved outcomes and sustainable results. For a more in-depth discussion and analysis of how the Community Health Hub helps meet the challenges of sustainable healthcare change, download our white paper today. At no time in our nation’s history have the needs of healthcare and human services been more aligned. Today’s health and human services agencies share a central goal: serving clients and delivering quality services that lead to better outcomes. However with the complex physiological, social and economic pressures facing clients today, agencies find it increasingly challenging to deliver whole person care that leads to lasting change in a siloed delivery system. This is especially true with the complex physiological, social and economic issues that are present in impoverished communities throughout the U.S. These can be difficult to predict or control; and out in the field where the work is being done, they can quickly present a series of unsurmountable challenges. Communities and the organizations trying to serve them, suddenly find themselves in a crippling spiral and the cumulative social and economic toll on the individual and the community can be staggering. Healthcare: Between 2009 and 2018, racial health disparities alone are expected to cost $337 billion for health insurers, according to the RWFJ report. The money spent on healthcare in 2014, for example, was a whopping 17.5 percent of GDP. National Security: Health inequities that produce stubborn health problems in young people, in concert with the problems of poor education or criminal misconduct, have caused about 26 million young adults to be unqualified to serve in the U.S. military. Acknowledging that the root causes of health inequities are “diverse, complex, evolving and interdependent,” the panel calls for greater investment and collaboration across sectors to address the multiple factors that influence health and to change the types of policies, practices and systems that have kept inequity in place. Organizations and communities continue to struggle to realistically and effectively address and improve the environmental conditions necessary to improve health and economic self-sufficiency of those they serve. Because of this, patients in a lower socio-economic status continue to suffer from issues such as higher rates of chronic disease, higher infant and maternal mortality, substance abuse and addiction, domestic violence, child abuse, neglect, juvenile delinquency, violent crime, mental health disorders and the like. Despite these struggles, collaborative technology, shared treatment protocols and shared data security can drive benefits in improved health outcomes, improved economic self-sufficiency, healthier communities, lower healthcare costs and better health education. This ultimately leads to the ability to realistically and effectively create a person-centric, transformational community change — maximizing existing funded services to improve health and economic self-sufficiency for individuals and families. Learn how the Community Health Hub creates a solution that effectively addresses the issue of the negative impact of poverty on healthcare — and creates a unified technology that bridges the gap between healthcare and the lack of resources for social determinants to deliver improved outcomes and sustainable results. Salt Lake City – September 28, 2017 – NICE inContact (Nasdaq:NICE) today announced that RiverStar has joined the DEVone developer program and has an agent desktop product available on CXexchange marketplace, the most extensive technology ecosystem currently available in the customer experience market. Products available on CXexchange are designed to integrate with NICE inContact CXone™, the world’s #1 cloud customer experience platform. RiverStar provides the RiverStar Unified Agent Desktop that extends My Agent eXperience – MAX agent interface on CXone with the ability to unify agents’ desktop workflow experience. Unified Agent Desktop integrates tightly with both NICE inContact CXone and a company’s existing business systems – creating a single workspace to seamlessly manage customer interactions and providing agents with all the information they need in one central view. DEVone offers partners broad tools and resources to enable them to create new applications on CXone including over 250 available APIs, extensive documentation and support, and access to an online developer community. Companies interested in how RiverStar works with CXone can visit CXexchange to view the application, see a demo and read reviews. CXexchange is a centralized, state-of-the-art marketplace for developers to market and sell their CXone-based applications. This press release contains forward-looking statements as that term is defined in the Private Securities Litigation Reform Act of 1995. Such forward-looking statements, including the statements by Mr. Jarman, are based on the current beliefs, expectations and assumptions of the management of NICE Ltd. (the Company). In some cases, such forward-looking statements can be identified by terms such as believe, expect, may, will, intend, project, plan, estimate or similar words. Forward-looking statements are subject to a number of risks and uncertainties that could cause the actual results or performance of the Company to differ materially from those described herein, including but not limited to the impact of the global economic environment on the Company’s customer base (particularly financial services firms) potentially impacting our business and financial condition; competition; changes in technology and market requirements; decline in demand for the Company’s products; inability to timely develop and introduce new technologies, products and applications; difficulties or delays in absorbing and integrating acquired operations, products, technologies and personnel; loss of market share; an inability to maintain certain marketing and distribution arrangements; and the effect of newly enacted or modified laws, regulation or standards on the Company and our products. For a more detailed description of the risk factors and uncertainties affecting the company, refer to the Company’s reports filed from time to time with the Securities and Exchange Commission, including the Company’s Annual Report on Form 20-F. The forward-looking statements contained in this press release are made as of the date of this press release, and the Company undertakes no obligation to update or revise them, except as required by law. Those interactions are easily handled and don’t require complex support to address them. Other interactions, on the other hand, can be much more complex: Why isn’t my system working the way I expect it to? Frequently, customers have multiple questions that need addressing. The focus of a customer facing support system should be on delivering a flexible, adaptive workflow that can lead to first call resolution of the customer’s request for virtually every reasonable customer interaction. One of our clients found that 83% of their customers would consider switching vendors over a single customer interaction that was not resolved upon first reporting it. This is consistent with the 89% reported by Gartner. Handling those situations requires more than simply looking up a piece of information and providing it to the customer. Being able to drill down and troubleshoot an issue requires detailed knowledge of the product or service and supporting business processes. Customers also frequently shift directions in the middle of an interaction and the agent needs the ability to shift smoothly with them from a billing inquiry to troubleshooting a problem to ordering a new accessory. Agents need an adaptive workflow which can support simple inquiries, as well as intelligent troubleshooting and decision making. That workflow needs access to all of the relevant information about the customer to personalize the interaction. Agents should be empowered by their systems to address all of the customer’s needs in a single interaction. The workflow needs to ensure that agents have control over the paths they follow while ensuring that all of the required information is obtained to support successful resolution of each of the customer’s issues. The workflow needs to enable the agent to queue up additional issues to be addressed while ensuring that each issue is fully resolved within the context of that specific customer. Contact Us to talk about how we can help you ensure that your agents can support dynamic, personalized customer interactions using adaptive workflows within our Unified Agent Desktop. Customers want to be known. They expect every interaction to be based on the complete knowledge of the existing relationship between the two of you. They are intimately aware of the last product or service they bought from you and the last time they called or emailed to complain about something. They fully expect whomever they talk with on your behalf to be as fully informed as they are about the relationship. That knowledge changes with every interaction. Every member of your staff that interacts with the customer needs to have all of that information at their finger tips AND it should help guide the interaction. Having all of the information about what products and services a customer has purchased, what their warranty statuses are, when they are due for service, what upgrades might be available, how to trouble shoot them, etc. all provide clear evidence of competence and understanding of the customer and their needs. It makes you more likely to be able to address whatever question or issue they may have, which will directly affect their customer satisfaction and brand loyalty. Picking the right moment in the dialog to ask about a supposedly resolved problem can help build a connection and increase loyalty and is one example of personalizing the interaction. Providing unsolicited information based on your knowledge of the products and services the customer has purchased can also be a useful way to personalize the interaction. Mr. Smith, were you aware that Lee Child is releasing a new book in the Jack Reacher Series next month? That information is probably not relevant to most people, but this customer has bought every book in that series as soon as each book was released and it would be very welcome news to him. Personalization could also be just confirming known preferences. Would you like an aisle seat near the front? Would you like a king sized bed in a room away from the elevator and back from the highway? Both of those examples illustrate that you understand what the customer prefers and will try to meet his needs. That is the essence of what personalization is all about. The information you need to personalize your interactions exists today in your systems. The challenge is making it available to your team in a timely, easy-to-use manner. Contact Us to talk about how we can help you personalize your interactions. Those all are tied to delivery of outstanding customer service. The top strategic initiative being worked on is empowering agents with better information. Getting the right information to the right person at the right moment is critical to providing outstanding service. That information needs to allow the interaction to be personalized. The agent needs to know who the customer is, what products and services they have purchased, what troubles they have reported, what their payment status is, how they like to communicate, and a myriad of other information. That information should be used to help guide a dynamic, adaptive dialog within a process-based workflow. All of this needs to happen within a unified agent desktop that provides instant access to information the agent needs to address concerns the customer raises during their interaction. This same rich dialog should be able to take place across every channel the customer chooses to use, including voice, web self service, and website-based chat. You need to be able to optimize the processes guiding the interactions. To do this, you need to collect every piece of information available about the interaction as it happens, every page turn, button click and piece of data entered. This information becomes the foundation to allow you to analyze not just the success of that individual interaction, but thousands of interactions to see how the process can be improved using techniques like dynamic real time comparison of different processes. The key is to have a platform that lets you collect the information you need to optimize the processes. An important side benefit of delivering outstanding service is that when you do, you can actually reduce your operational costs. Contact us to discuss how you can both improve your customer service and reduce your ongoing operational costs. We will discuss each of the five functional sets of capabilities in individual blog articles over the next several months. RiverStar signed a contract with United Ways of California, South Pasadena, California. United Ways of California is an organization that provides free, confidential service that connects residents with local community-based organizations across the state, offering thousands of different programs and services for people seeking answers. In 2015, more than half a million California residents turned to 2-1-1 for health and human service information and referrals, and the numbers continue to grow. 2-1-1 has information on more than 30,000 different programs and services across the state. The United Ways of California – RiverStar team has collaborated to implement an evolving, comprehensive solution for California that manages the interactions between California 2-1-1 and the residents seeking assistance as well as allowing residents to receive assistance via a mobile responsive web portal. The solution is built using RiverStar Studio, a platform used to rapidly create web applications using a graphical drag and drop interface that doesn’t require traditional programming. The solution is centered on the RiverStar Unified Agent Desktop that is tightly integrated with the California 2-1-1 contact center platform provided by inContact. For California 2-1-1, the RiverStar Unified Agent Desktop, built using RiverStar Studio, has been configured to initially provide a scheduling application for the agents to use to schedule appointments with tax counselors to help residents with their taxes. It then will be extended to integrate with the iCarol reference information platform that is used by California 2-1-1 to quickly pull information needed to assist residents with their specific issues such as broadband service eligibility screening and enrollment and Cover California screening and enrollment. All the solutions developed or planned for 2-1-1 e.g. tax appointment scheduling, broadband service eligibility screening, Cover California screening and enrollment will also have a mobile responsive self service component which will allow residents to obtain assistance. This solution is intended to become the focus for all interactions with the residents.